About the RPG style of Korean online game, there are getting the 2D characters plus a well-modeled 3D landscape brighten the game appearance. Easy interface of playing RO.. In RO world, there are many of places have different of cultures..For example, the players have different of clothes..And another monsters and undeads; Ghosts, Zombies, Dark Gods, Holy enemies and Monsters in Midgard, Factory Town, Ghost Town, and etc.. The players can capture and tame certain monsters as their pet. They also can create own guild and invite other player join in their guild so it can help to level up them so easy. They can equip their weapon and clothes which they are buying from the shops. If your character cannot bring many items, you can store some items and weapons in your storage which provided by NPC player. The player can trade some items with other player.. If you want cheap or discounts, you should find the merchants because the merchants can sell and buy cheap item for you! By gaining money, the player have to fight with the monsters because they really need the potions, herbs, upgraded weapon, and etc..
A player will change jobs multiple times over the course of playing, though the number of changes will be determined by choices made by the player.. 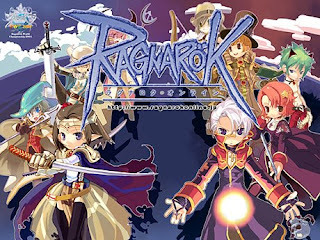 Since I started to study in Multimedia University, my senior, Hwa introducted new multiplayer game 'Ragnarok' to me. I don't know what is it because I never play the multiplayer game with other players. I always play the single games only, right? :P He teached me about how to play in the game..I really enjoyed to play Ragnarok~ I like to see the cute characters and monsters..haha. My roommate and best friends suddenly want to join with me after I told them about Ragnarok! :O Ragnarok is really popular! I always busy to level up my characters until 99 levels! @_@ It is not easy to gain more points while busy killing MVP, Dark Gods, Holy Khights and Big monsters.. My friends and I always help each other if we want to level up so fast. I really like my character's jobs are Sniper, High Priest, Alchemist/ Creator, Gunslinger and Master Smith. For me, Sniper is better because it is very easy to level up and can use falcon to help me to attack. But, my friends said knight and assassin are very fast and strong and sure gain more points, but they need to use many potions. Gunslinger can used the different of guns- really cool! ..hehe Merchant really be hard because it is hard to level up but, when become master smith can get ability to make new weapons, and attack the monsters so fast! The priest must be in a group of friends because it is very safe. The players also need priest's help because they can heal the players on anytime. They can revive the players who killed~! The priest can use ability 'teleportation' to another place, and attack the undeads, ghosts and zombies only. I really like to see the beautiful of cast magic by the high priests.. They can cast magic 'Sanctuary ', 'Lex Aeterna', 'Magnus Excorcis' and many.. I like cute job- Alchemist/Creator because the alchemists have the ability to make potions and to summon creatures in battles, but if they become Creator, they can throw acids or potions to attack the monsters - 100,0000!! :O Wow amazing attacks! omg..this revoke my old memories! I was just surfing around your blog!